As part of Ker & Downey’s 2010 Next List, Cambodia is among the up-and-coming destinations for the elite traveler. Amidst the jungles and ancient temples of this enchanting region, luxury travel is simplified and visitors are treated to a charming brand of devoted hospitality in absolute splendor. 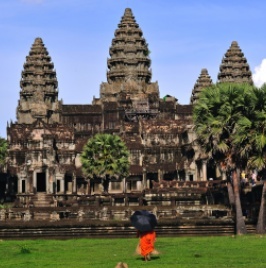 Formerly part of the French colonial empire, Cambodia is a nation with an intriguing past and an emerging future. The history of Cambodia is rich and vast, from the mysticism of the Ankgor civilization to the regal era of kings. 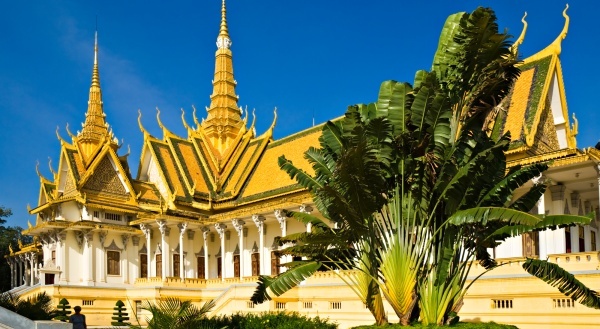 The Royal Palace and National Museum in in the kingdom’s capital, Phnom Penh, hold treasures such as prehistoric Khmer artifacts, bronze works and a life-size diamond-encrusted Buddha. The distinct French-Colonial architecture of Phnom Penh earned the city the nickname “the Pearl of the Orient” and French influences mingle with Khmer styles throughout most of the country. Intricate sandstone tower s and bas-reliefs define the astounding Angkor Wat complex. This massive UNESCO World Heritage site is a favorite destination in Cambodia, home to dozens of 12th-century Hindu temples, public squares, courtyards and religious sites, including the Bayon Temple. At first glance, the Bayon Temple seems like a shapeless mass of stone, but further scrutiny reveals enigmatic faces all looking serenely at passers-by. A jungle-clad temple left to nature, it is a must see at sunset when the fading light enhances the mysterious ambiance. Explore the complex by foot or by bike with your guide. The complex is an amazing sight by air and the Cambodia Panorama journey includes a magnificent hot air balloon ride over the sprawling grounds. Cambodia’s gorgeous southern coast is a surprise to many visitors, featuring many mid-century resort towns with white sand beaches and a growing number of beautiful resort properties on the Gulf of Thailand. Snorkeling, fishing and watersports are popular activities on the coast, with several secluded islands accessible for a day-long picnic. 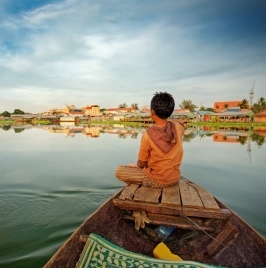 An ideal destination for those interested in philanthropy, Cambodia’s experiential travel opportunities are numerous, especially in the riverine communities along the Mekong River. Visit centuries-old artisan villages and the Cheung Kok Ecotourism Village, a small settlement developed with the support of AMICA. Intriguing floating communities dot the massive Tonle Sap Lake, where several series of tethered structures are the unique homes to thousands of Cambodians. There are also many chances to offer alms to the tiny Buddhist monasteries and receive a special blessing from the monks in return. Luxury travel in Indochina is effortless with the careful planning and expertise of the Ker & Downey professionals. Contact us to start planning your trip to Cambodia and consider making the other Next List countries of Thailand, Vietnam and Laos part of your travel adventure.